When you listen to a piece of music, what do you listen for? Most of us listen TO music that we are reasonably familiar with and listen FOR those clues that make us comfortable. If you’re my age, that could mean ‘classic’ rock and roll. If you have my academic background, that could mean ‘classical’ music. If you share my spiritual heritage, that could mean ‘traditional’ church hymns. Or not. Years ago, a teenage friend (I was about 24-25 at the time) told me that I was ‘old-fashioned’ and ‘stuck in my ways’, that I ‘would never relate’ to the ‘younger generation’. Ouch! Since then, I’ve tried to drink often from the firehose of new music that gushes from our culture – even some odd bits for a guy my age. So, when a co-worker told me that her son had put out a new CD, I was interested in hearing it. But when I found out that his instrument of choice was a Nintendo GameBoy, part of me wanted to discount his efforts immediately. Thankfully, the more reasonable part of me decided to give it a listen… and found a nice surprise. As I listened, I got the feeling that I was seeing a good artist at work, one who had deliberately chosen a box of crayons – the box with 16 colors. It’s not that the artist can’t control color, the point is that the artist chooses the limitations of the media. And he has done well with his choices. So if you’re interested, and you can listen past the GameBoy stereotype, check out CCIVORY on myspace. The album is called “TO LOVE AND TO HOLD”; my favorite track is Satellite Sky (#2), but I also liked #10, #11, and #12 among the others. Listen closely, and past the stereotype; surprises await. Dean “Playmate” acoustic bass. Who names these things? I’ll probably have to put a sticker over the headstock before I play this in church. However, a local guy on Craigslist sold this to me for a great price, and I like its sound. Reviews of the bass from around the web say that it sounds reasonably decent considering its $150 list price; my experience is that it actually sounds better than some acoustic basses at more than twice the price. Unfortunately, the passive piezo pickup (say that 3 times really fast) gives an uneven and wimpy response. I do like having an bass that doesn’t have to be plugged in. Squire (by Fender) 5-string. Another Craigslist deal. It doesn’t have the traditional Fender headstock or body shape, but it plays rather nicely and sounds fine. “Everyone” seems to think that a 5-string is really great, so I decided to give it a try. After a bit of practice, I’m not so sure a 5 fits into my long-range plan, but time will tell. I’m really a fairly basic player, so having the extra ‘range’ turns out not to be so big a deal. Yamaha RBX360 4-string. This one came from Ebay, but the seller was local. We were able to meet and avoid shipping costs, which was rather generous on his part. I really like the small, light body on this bass, even though the lighter wood seems to gather dings rather easily. No more ‘headstock dive’, either. 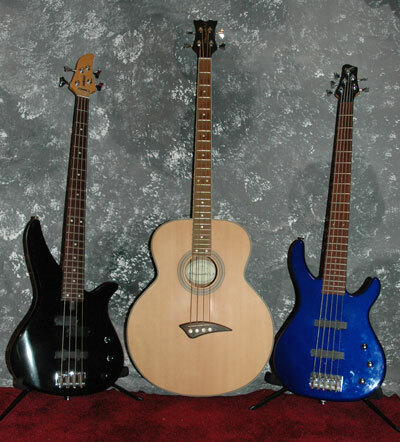 None of these basses are expensive or prestigious, but they’re still capable. Maybe I’ll sell the 4 and 5 to upgrade, who knows? In the meantime, these are a lot of fun. You are currently browsing the archives for the instrument category.